she can be seen walking alone is inspired by stories personal and community based that weaves women’s experience with gender identity and their ability to find space, voice, and spirituality. What kinds of expressivity is possible in pushing through constraints upon us? What emerges when we dig into history and mythology to create images for present day survival? Magnolia Yang Sao Yia (YSY) is a dancer, choreographer, thinker, and dreamer. Her passions include intersecting social justice and dance, nurturing and empowering youth and women of color, and investigating and exploring the contemporary and diasporic Hmong identity in America, and Hmong dance. 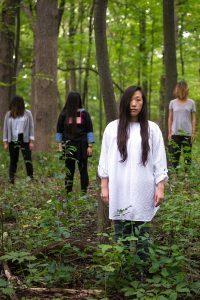 YSY identifies herself as a Hmong woman located in the United States, and is exploring that identity through her choreographed works. The marginalized experience as a woman of color and displaced person shaping her social and political perspective, and the continuum of patriarchy within her cultural context facilitating the violence and injustice taking place through her past and present history are important subjects in which she chooses to address.